WASHINGTON — Momentum has grown in recent days for a last-ditch GOP effort to partially repeal and replace Obamacare, movement that appears driven as much by the politics of health care as the policy behind it. The legislation that Republicans are rallying around is seen as the final hope of repealing major parts of the Affordable Care Act, a campaign promise the party has repeated for seven years and one they have failed to deliver on so far. The lack of progress has turned into a source of great frustration to both their base voters and President Donald Trump. "Every Republican found out from our constituents that they were pretty upset with the fact that we did not follow through on what we've all been running on," Sen. Ron Johnson, R-Wisc. said. "I can only speak for the folks that I talked to in Wisconsin, but nobody blamed Trump for our failure in health care. Nobody." That's why “it’s not the policy, but the politics” fueling this renewed push, said Marc Short, Trump’s legislative affairs director. The details of the bill, known as Graham-Cassidy, don't appear to address the policy concerns of a handful of Republican senators who either voted against the last version of the legislation or reluctantly supported it because of promises that it would be revised before becoming law. Despite some continued misgivings, however, there is as least some fresh optimism that the majority party can bring together the 50 votes they need for the bill to pass the Senate and get sent on to the House of Representatives. “It’s an intriguing idea and one that has a great deal of support,” said Senate Majority Leader Mitch McConnell Tuesday morning during his opening remarks on the Senate floor. Sen. Lindsey Graham, R-S.C., one of the authors of the bill, rode on Air Force Two with Vice President Mike Pence Tuesday from New York to make it back to the Senate for the weekly Republican conference lunch. The vice president had a message to deliver. "I want to make sure that members of the Senate know the president and our entire administration supports Graham-Cassidy. We think the American people need this." "This is the moment, now is the time," Pence added. Even though the previous Senate bill was largely unpopular among Americans in general, garnering just 17 percent support in some polls, it was far more popular with the Republican base and even GOP donors who think party leaders are wasting their opportunity to get things done. Sen. Dan Sullivan, R-Alaska, said he heard from "a lot" of his constituents that "people are very dissatisfied with the status quo." 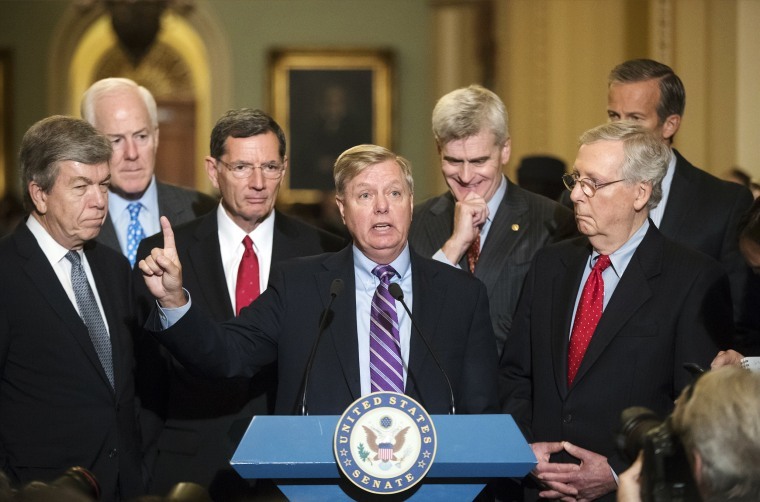 But Graham-Cassidy, named for its co-authors Graham and Sen. Bill Cassidy, R-La., does little to alleviate the concerns of senators like Susan Collins, R-Maine, and Lisa Murkowski, R-Alaska, two of the three Republicans who voted against the last GOP health care bill. And the quick, closed-door process has yet to change this time around, something that has raised objections from Sen. John McCain, R-Ariz., who also voted against the last bill. Republicans need the support of 50 senators for the measure to pass with Pence’s tie-breaking vote. But reconciliation, the legislative vehicle that allows them to do it by a simple majority, instead of 60 votes, expires on September 30, leaving just a few days for this last-ditch effort to happen. Meanwhile, several other senators who have had concerns with the GOP approach, including Sens. Dean Heller, R-Nev., and Johnson of Wisconsin have signed on as co-sponsors to this bill despite the lack of changes in the details. Graham-Cassidy still cuts funding for Planned Parenthood for one year and it winds down the Medicaid expansion starting in 2020. It also maintains two proposals from the previous Senate bill that changes the Medicaid funding formula so that it is, in part, based on population and reduces the amount of money it would increase each year — two components that would likely lead to cuts to the program. Murkowski met with McConnell to discuss health care Monday night and remains undecided on whether or not to support this bill. In Alaska, where health care costs are much higher than in other parts of the country, one-quarter of all residents rely on Medicaid as well as one out of every three children. She received a warm reception in Alaska after her "no" vote in August, but said she would support Graham-Cassidy if the numbers work for her constituents. "My governor has said, 'Hey I like flexibility but if I get half as much money, flexibility doesn’t help me.' So in fairness to my governor and in fairness to Alaskans, the numbers actually matter," Murkowski said. "And so if it can be shown that Alaska is not going to be disadvantaged (and) we gain additional flexibility, then I can go back to Alaskans and I can say ‘O.K. let’s walk through this together.’ That’s where it could be different but I don’t have that right now." Sen. Collins said she still has serious concerns. “The Maine hospital association has calculated that over the next ten years Maine would receive over $1 billion dollars less in Medicaid and other federal health care spending and that obviously is of great concern to me,” Collins said. Collins walked on the Senate floor carrying a green folder with a chart that told how much each state was going to lose in health care funding under Graham-Cassidy. One of the people she wanted to speak to was McCain. McCain said “it’s very important” that his Republican Governor, Doug Ducey, came out Monday in support of the bill but that he still is opposed to the process. McCain, however, called the process “better” after he was told the Senate Finance Committee will hold a hearing on Graham-Cassidy on Monday. But if the Senate votes, it would happen before the Congressional Budget Office can compile a complete score of the legislation. The non-partisan scorekeepers said Monday that they would be unable to determine Graham-Cassidy’s impact on coverage, cost of premiums and impact on the debt before next week. Still, Sen. Johnson, who complained about the process last month, has signed on as a co-sponsor to the bill. He said he’s “cautiously optimistic” about its passage. Since Republicans failed to pass health care, Trump has attacked them on Twitter and in public remarks, blaming them for not fulfilling a seven-year campaign promise to dismantle Obamacare. And polls show that despite Trump’s low approval ratings, Congressional Republicans’ poll numbers are lower. Trump has since turned to work with Democrats on two major issues, leaving Republicans by the wayside. He struck an agreement with Democrats on hurricane relief and short-term government funding and the debt limit. He also worked out the beginnings of an agreement on undocumented children and young adults. Still, the lack of enthusiasm is apparent as Republicans wrestle with giving health care one more shot. “If you put a gun to my head today and said you have to vote yea or nay, I’d vote yea,” said Sen. John Kennedy, R-La.